The Apache® Spark™ compute engine has gone viral – not only is it the most active Apache big data open source project, but it is also the fastest growing big data analytics workload, on and off Hadoop. The major reason behind Spark’s popularity with developers and enterprises is its flexibility to support a wide range of workloads including SQL query, machine learning, streaming, and graph analysis. 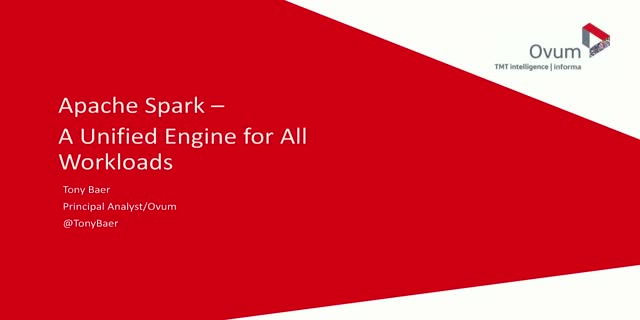 This webinar features Ovum analyst Tony Baer, who will explain the real-world benefits to practitioners and enterprises when they build a technology stack based on a unified approach with Apache Spark. Findings around the growth of Spark and diverse applications using machine learning and streaming. The advantages of using Spark to unify all workloads, rather than stitching together many specialized engines like Presto, Storm, MapReduce, Pig, and others. Use case examples that illustrate the flexibility of Spark in supporting various workloads.